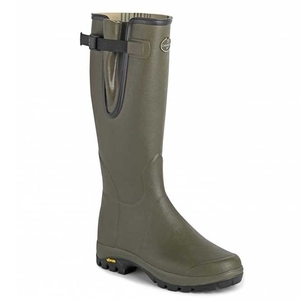 Le Chameau Vierzon Vibram Jersey Wellington Boots. A jersey lined version on the classic Vierzon shape but with a hard-wearing Vibram sole. A year-round wellington, perfect for walking in. Great wellies lightweight and comfortable with a Vibram sole for long walks. Fantastic service from Uttings - were so very helpful with queries, brilliant customer service. Excellent Boots as expected Having had cheap pairs which last months, my last pair of Chameau's lasted 4%2B years, worn at least twice a day &amp; walking miles.These last &amp; last, are very comfortable, don't ever perish and really are value for money if you bear in mind how long you have them. I love them &amp; wouldn't buy anything different. If you want serious wellies, these are they! Excellent product and came with boot bag included in the price. Fit is true to sizing. So far so good.Put the boots through all weathers and all terrain.Comfortable from first use and vibram have excelled yet again.! Excellent. Comfy boots worth paying that bit extra for something that will last.